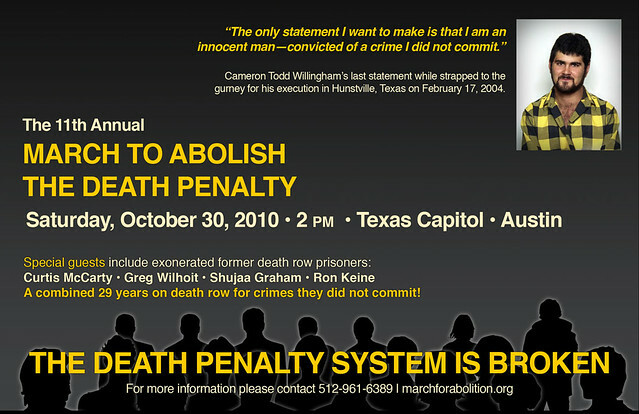 Before his execution, Todd Willingham said,“Please don’t ever stop fighting to vindicate me.” On October 30 at 2 PM, you can join the fight by attending the 11th Annual March to Abolish the Death Penalty at the Texas Capitol in Austin. The 11th Annual March to Abolish the Death Penalty will be held in Austin at the Texas Capitol at 2 PM on October 30, 2010. Contact the march organizers if you would like to volunteer or if your organization would like to be listed as a co-sponsor. Special guests this year include 6 exonerated former death row prisoners Shujaa Graham, Ron Keine, Gary Drinkard, Curtis McCarty, Albert Burrell and Greg Wilhoit. Curtis spent 21 years in prison – including 19 years on death row – in Oklahoma for a crime he did not commit. Shujaa spent 3 years on death row in California for a crime he did not commit. Ron spent two years on death row in New Mexico for a crime he did not commit. Gary spent almost 6 years on death row in Alabama for a crime he did not commit. Albert spent 13 years on death row in Louisiana for a crime he did not commit. Greg spent five years on death row in Oklahoma for a crime he did not commit. Also speaking will be Ron Carlson, whose sister Deborah Ruth Carlson Davis Thornton and Jerry Lynn Dean were murdered in Houston with a pick-ax by Karla Faye Tucker and Daniel Ryan Garrett. Ron opposes the death pealty and witnessed Tucker’s execution in Huntsville at her request. Elizabeth Gilbert will also speak at the 11th Annual March to Abolish the Death Penalty at 2 PM on October 30th at the Texas Capitol in Austin. She is a Houston teacher and playwright who befriended Texas death row prisoner Todd Willingham. Her story is featured in the New Yorker article by David Grann about the case as well at the Frontline Documentary “Death by Fire” (Click to watch online). Elizabeth actively investigated the case on her own. She became convinced of Todd’s innocence and was instrumental in helping his family find an expert fire investigator to examine his case. Sandrine Ageorges-Skinner will also speak. Sandrine is a French citizen married to Hank Skinner, who is on Texas death row and is seeking to have DNA tested that could prove his innocence. On October 13, the U.S. Supreme Court heard oral arguments in the case of Hank Skinner to determine if he may seek testing of DNA evidence through a civil rights lawsuit. If he is not allowed to test the DNA evidence, then Texas may execute an innocent person. Terri Been will speak about her brother Jeff Wood, who is on death row even though he did not kill anyone. Jeff was convicted under the Texas Law of Parties, which allows people like Jeff Wood and Kenneth Foster, Jr to have been sentenced to death even though they never killed anyone or intended anyone to be killed. Foster received a commutation to life in prison in 2007, but Wood remains on death row. Delia Perez Meyer, whose brother Louis Castro Perez is on death row, will speak and will invite any family members of people on death row to come to the front of the rally to be acknowledged. Other speakers will be announced later. “This is fast becoming one of the biggest anti-death penalty events in the country. I’ll be there“, said death row exoneree Ron Keine. Each October since 2000, people from all walks of life and all parts of Texas, the U.S. and other countries have taken a day out of their year and gathered in Austin to raise their voices together and loudly express their opposition to the death penalty. The march is a coming together of activists, family members of people on death row, community leaders, exonerated prisoners and all those calling for repeal of the Texas death penalty. Last year’s march was the largest anti-death penalty rally in Texas since the first ever march in 2000. We will be joined this year by the Journey of Hope, which is an organization led by murder victim family members joined by death row family members, family members of the executed, the exonerated, and others with stories to tell, that conducts public education speaking tours and addresses alternatives to the death penalty.